Purpose: Many states are exploring alternative provider models and examining the role of the dental hygienist to address access to care challenges as the United States continues to face increasing demands for oral healthcare services. The purpose of this study was to assess dental hygienists' opinions in the state of Oregon regarding the current limitations of dental hygienists' scope of practice, perceived need for a mid-level provider in Oregon, and personal interest in becoming a mid-level provider. Methods: In December 2013 a survey was mailed to a sample of 1,231 dental hygienists registered in Oregon representing 30% of the licentiates. All licentiates holding expanded practice permits (EPP) were included in the sample (n=351). The following categories were included in the 32-question survey: scope of practice, mid-level provider, current practice, and demographics. Results: A total of 440 surveys were returned for a response rate of 36%. Of the EPP holders, 51% responded to the survey. Over half of respondents (59%) believe that a mid-level provider is needed in the state. Respondents holding membership in the American Dental Hygienists' Association, as well as EPP holders, were significantly more likely to respond that a mid-level dental provider was needed in the state (p<0.0001). Ninety-one percent (n=400) of respondents agreed or strongly agreed that if a mid-level provider was introduced in Oregon, the new provider should be a registered dental hygienist model. Forty-three percent (n=186) of respondents were interested in becoming mid-level providers and 47% (n=203) of respondents believed that the minimum education for a mid-level provider should be a bachelor's degree. The majority, 74% (n=137), of those interested in becoming a mid-level provider indicated a preference in completing their education through online teaching combined with a clinical internship. Conclusion: There is strong support from dental hygienists in Oregon that a need exists for a mid-level dental provider and that this provider model should be dental hygiene based. Individuals interested in developing a curriculum for a mid-level provider should consider including online teaching components with a clinical internship component. As the United States continues to face increasing demands for oral healthcare services, many states are examining alternative provider models as well as the role of the dental hygienist to meet their access to care disparities.1,2 As a result, consideration of a dental therapist or mid-level provider model has had increasing momentum in a number of states.3,4 Mid-level providers can perform a wide range of clinical services including restorative procedures and simple extractions as well as the preventive services of a dental hygienist depending on the state. Some form of dental therapy has existed in New Zealand, Australia, and the United Kingdom dating as far back as 1920, and the role of the dental therapist continues to expand along with the populations served by these individuals.5 Mid-level provider models have been utilized in at least 53 other countries around the world and evidence shows that they provide safe and effective dental care.6-8 The US has implemented mid-level dental providers in Alaska, Minnesota, Maine, and most recently Vermont.3 Dental Health Aide Therapists (DHAT) in Alaska have expanded much-needed access to dental care and prevention services for more than 40,000 Alaskan Native people living in 81 rural Alaskan communities since 2004.9 Regulated by the Indian Health Service, Alaska DHATs have demonstrated safe, effective delivery of care and are well received in their communities. In 2009, Minnesota became the first state, outside of Alaska, to pass legislation allowing for the creation of a new midlevel provider. Minnesota legislature adopted a version of the ADHA's mid-level provider model, the Advanced Dental Therapist (ADT) while simultaneously adopting the Minnesota Dental Association's Dental Therapist (DT) model. ADT students must be actively practicing licensed dental hygienists and will earn a master's degree upon completion of the education program. Students in the Minnesota DT program earn either a bachelor's degree or a master's degree and are not required to be licensed dental hygienists. While the DTs are able to administer nitrous oxide and local anesthesia, they may not provide dental hygiene services or perform simple extractions16 The first graduates of these programs entered the workforce in 2011. Continued research and outcomes assessment is necessary to show the successful integration of both provider models in Minnesota. Initial reports document high patient satisfaction, safe practice, and decreased travel and waiting time for patients' who reside primarily in rural locations.17 As of this writing, the Minnesota DT program has closed, while the ADT program continues. A midlevel provider does not currently exist in the state of Oregon. However, similar to 37 other states, Oregon does have a direct access dental hygienist model under the title of Expanded Practice Dental Hygienist (EPDH).18 EPDHs are able to provide preventive services, without the supervision of a dentist, for patients who are unable to access dental care or live in regions of the state with limited access (Figure 1). While EPDHs have the ability to practice with a wide range of patient populations, the majority of EPDHs practice with either pediatric or elderly populations.19 Research by Bell et al. demonstrated that Oregon EPDHs are not practicing to the full extent of their permitted abilities, thus potentially lessening their impact.19 Additional studies identified that practicing EPDHs in Oregon face significant barriers related to reimbursement for services provided in addition to having limited business knowledge.20,21 Because of the barriers faced by EPDHs as well as evidence of their limited impact since the introduction of the permit in 1997, a logical next step would be the investigation of an alternative provider model in Oregon. To that end in 2011, senate bill 738 was passed approving dental pilot projects in Oregon. Legislative language used for an alternative provider pilot project in Oregon does not necessarily require the individual to be a registered dental hygienist. The legislation specifically states that the pilot projects must achieve at least one of the following: teach new skills to existing categories of dental personnel; develop new categories of dental personnel; accelerate the training of existing categories of dental personnel; or teach new oral health care roles to previously untrained persons.22 Expanded practice permit (EPP) holders in the state of Oregon are a group of individuals who may have a direct interest in the development of a midlevel dental provider particularly those who have faced significant barriers to providing care due to the current practice limitations of the permit. Although the ADHA supports a dental hygiene based mid-level provider model, there is no documented research on dental hygienists' opinions or interest in pursuing a mid-level provider license. It is reasonable to assume that Oregon dental hygienists who are also members of ADHA would likely support a mid-level provider model utilizing a dental hygienist. If a pilot program similar to Minnesota's ADT or DT were to be implemented in Oregon currently licensed dental hygienists would be needed to enter any dental hygiene based programs. The purpose of this study was to assess Oregon dental hygienists' opinions regarding the scope of practice limitations of dental hygienists; perceived need for a mid-level provider in Oregon; and personal interest in becoming a mid-level provider in Oregon. A 32-question survey was developed in consultation with the chair of the Oregon Dental Hygienists' Association Government Relations Council. The survey instrument contained both closed and open-ended questions in the following categories: scope of practice, mid-level provider, current practice, professional association membership, and demographics. The scope of practice questions focused on perceptions of limitations in current scope of practice as well as knowledge of the Oregon Expanded Practice Permit. The mid-level provider questions focused on the perceived need of a mid-level provider, personal interest level in becoming a mid-level provider, and mode of education delivery for a midlevel provider in Oregon. Current practice questions were focused on the respondent's current employment. This study was approved as exempt by the Pacific University Institutional Review Board. A current list of registered dental hygienists and expanded practice permit holders was obtained from the Oregon Board of Dentistry in the fall of 2013. At that time, there were 4,101 registered dental hygienists in Oregon; 356 licentiates also held an EPP. All EPP holders were selected to receive the survey while the remaining 875 participants were randomly selected from the total number of licentiates. To examine the content validity of the survey, it was piloted tested with 5 expanded practice dental hygienists and subsequently revised. A total of 1,231 individuals, or 30% of the Oregon registered dental hygienists were selected to receive the survey; 351 of the total number held EPPs. A paper survey was mailed in December 2013 to 1,231 registered dental hygienists in Oregon. A follow-up reminder postcard was sent one week after the initial mailing. A second mailing was sent in January of 2014 to all non-respondents. The surveys were numerically coded for confidentiality. A linkage file was maintained solely to facilitate the second mailing. Once data collection was completed, the linkage file was destroyed. The mailing included a consent document explaining the purpose of the study and confidentiality. In addition to a copy of the survey and the consent document, a business reply envelope was included; consent was implied by return of the survey. Surveys were manually entered into SPSS (version 22, IBM) for data analysis. For questions related to scope of practice limitations, two investigators determined the preliminary categories for the analysis of qualitative data. Each investigator categorized the answers individually and the answers were then compared. Interrater reliability was assessed and discrepancies were identified. It was determined that discrepancies were due to oversight and differing interpretation. Investigators corrected oversights and resolved differing interpretation through discussion. Additional categories were added if at least three individuals answered similarly. If a response had less than three respondents reporting similarly the response was placed in the “other” category. Anywhere consensus could not be reached on a particular answer it was also placed in the “other” category. Frequency distributions are provided to describe the findings, and Chi-Square tests were used to investigate whether possible factors such as level of education, holding an expanded practice permit, age, and professional association membership had a relationship to the midlevel provider questions. Expanded practice permit status and professional association membership were selected as explanatory variables because it was anticipated that individuals with those characteristics may have a greater interest in advancing the profession and expanding the scope of practice for dental hygienists. A total of 440 surveys were returned for a total response rate of 36%. One hundred eighty-one of the respondents held an expanded practice permit resulting in a 51% response rate for the total number of expanded practice permit holders in the state. The average age of survey respondents was 47 years; 98% (n=434) were female. Additional demographic information such as level of education, years since graduation, age categories and type of practice setting is summarized in Table I. The majority of respondents, 59%, (n=258) believed a mid-level provider was needed in Oregon and 43% of those individuals (n=186) were personally interested in becoming a midlevel provider. (Table V) A significantly higher percentage (p<0.0001) of ADHA members (70%), those holding an expanded practice permit (71%), and those who believed their current scope of practice was limited (61%), were personally interested in becoming mid-level providers (Table VI). No other factors were identified that significantly influenced respondents' likelihood to be personally interested in becoming a mid-level provider. Ninety-one percent (n=400) of the respondents agreed or strongly agreed that if a midlevel provider was introduced in Oregon, that individual should be a registered dental hygienist. (Table VII) When asked what level of education would be necessary for a midlevel provider, the highest percentage of respondents, 48%, believed education resulting in a bachelor's degree would be sufficient (n=205), followed by 39% believing in education resulting in a master's degree (n=167), and 14% believing in only requiring clinical education (n=60). Respondents currently holding a master's degree or higher as well as membership in the ADHA had a significantly higher percentage of respondents (p<0.001) who believed a master's degree should be the degree attained by a mid-level provider (Table VIII and Table IX). The most feasible avenue cited for delivering the education, for those personally interested in becoming mid-level provider (n=181), was online education delivery of theory combined with a clinical internship (Table X). Older, more experienced dental hygienists were more likely to believe their scope of practice was limited, as well as those who were members of the ADHA. Many of the responsibilities cited as appropriate duties to increase the scope of practice were the same responsibilities that a mid-level provider would be able to perform (diagnostic exams, place restorations, and perform simple extractions). Those who believed their scope of practice was limited were also more likely to be personally interested in becoming mid-level providers. Based on the results of this survey, it appears that there is greater interest in expanding the dental hygiene scope of practice, the longer the hygienist has been practicing. Over half of dental hygienists in the study sample believe that a mid-level provider is needed in Oregon. The number of respondents who believed a mid-level provider was needed was significantly higher among individuals holding an EPP and membership in the ADHA. An overwhelming majority of all respondents believed that if a mid-level provider model were to be developed in Oregon, it should be someone who is already a registered dental hygienist. This opinion stands in agreement with other groups, including the ADHA, who believe that a dental hygiene based model taps into an existing workforce with a long history of demonstrated effectiveness, and expands their education and scope of practice as a means to provide much-needed oral health care services to individuals who otherwise lack access.23,24 However, the pilot bill passed in Oregon does not require that the individuals in the demonstration programs be dental hygienists.22 While a number of survey respondents indicated a personal interest in pursuing a mid-level provider credential, the overall pool of registered dental hygienists available to fill a mid-level provider education program is potentially large. Dental hygienists holding bachelor's and master's degrees as well as membership in the ADHA were more likely to believe the minimum education for a mid-level provider should be at the master's degree level when compared with dental hygienists holding an associate's degree and were non-members of the ADHA. This group believed that advanced education resulting in a bachelor's degree would be sufficient for a mid-level provider. Contrary to the ADHA's position on advanced education for mid-level providers,12,13 the majority of the survey respondents believed that a bachelor's degree is sufficient. However, Oregon ADHA members had consistent opinions with their national association believing that a master's degree should be the degree for a mid-level provider. Individuals with an associate's degree in Oregon who expressed interest in becoming a mid-level provider made up 37% of the total number of individuals with a personal interest in pursuing this career pathway. The implications of an education curriculum resulting in a master's degree could potentially disqualify individuals who currently hold an associate's degree interested in pursuing this career pathway unless there is potential for individuals to earn a bachelor's degree in the process. The American Association of Public Health Dentistry Panel, charged with the principles, competencies and curriculum for educating dental therapists, advocates both a 2-year postsecondary level of training, or an additional year training program as part of a dental hygiene curriculum.25 In addition, California educators who were surveyed on the level of education necessary for an ADHP model implemented in medical settings reported approximately half of educators believed a dedicated master's degree was necessary and one third of respondents believed a baccalaureate level plus and ADHP certificate was sufficient.11 This is important information for those planning pilot programs to consider. Would individuals with an associate's degree be able to apply directly to pilot programs, or would they need additional prerequisites or a bachelor's degree to qualify? Most bachelor's degree completion programs for dental hygiene require two additional years of education. This could present a major barrier for interested candidates currently holding an associate's degree with the time required to attain the necessary credentials in addition to the financial cost. Still, only about 25% of the respondents to this survey believed that clinical education only would be a sufficient level of education for a mid-level provider. It appears that the majority of Oregon dental hygienists support a midlevel provider model that awards at least a bachelor's degree. People who were personally interested in becoming a midlevel provider were more likely to be members of ADHA, hold an EPP, and believe their scope of practice is limited, demonstrating that these individuals already possess a high degree of motivation. This also supports the assumption that EPP holders and professional association members strongly support the advancement of the profession and expansion of the scope of practice for dental hygienists. The majority of individuals personally interested in becoming a mid-level provider believe that a program delivered online combined with a clinical internship is the most feasible option compared with evening and weekend programs or the traditional onsite program. The traditional education process for mid-level dental providers internationally has been two years postsecondary education although several countries indicated that the training of therapists and dental hygienists has been combined into a three year academic program.8 While a side-by-side comparison of existing dental therapist curriculum content and length has been provided in the Kellogg report on training new dental health providers in the U.S.26, the utilization of a flexible curriculum for individuals working full-time as registered dental hygienists has not yet been explored. Based on the results of this survey, it is necessary to explore innovative ways to deliver training for mid-level providers while still maintaining a high level of competency to ensure the quality of care delivered. CODA standards for the dental therapist educational programs has encouraged innovation and experimentation with alternative ways of providing the required education and training, assuming the standards are met and competency can be demonstrated.10 A possible alternative curriculum model would feature the initial clinical instruction onsite at the education facility with the additional clinical competencies demonstrated and met through external sites where the dental hygienist is employed. This would require each site to have a dentist who has agreed to oversee the clinical education of the student. This model would also reduce the cost of equipment, faculty, and supplies required to perform all required clinical instruction at an institution. A limitation of this model would be the potential for issues of calibration with the dentists overseeing students' work. More investigation is necessary to find the right educational delivery for candidates who wish to continue full-time employment while perusing mid-level provider education. As of this writing, two pilot programs have begun the educational phase of programming as a result of legislation in Oregon. At this time neither program has pursued a model utilizing a registered dental hygienist to the extent of the ADHP. Workforce Pilot Project 100, “Oregon Tribes Dental Health Aide Therapist,” approved in February 2016, focuses on designing a new level dental provider and is modeled after the Alaska DHAT.27 Workforce Pilot Project 200, “Training Dental Hygienists to Place Interim Therapeutic Restorations”, approved in March 2016 focuses on teaching new skills to existing categories of dental hygienists.28 The Oregon Health Authority has stated it hopes to see additional pilot programs coming forward. 27,28 While the ongoing pilot programs are independent of utilizing a dental hygiene based model, the results of this study indicate a conceivable opportunity for stakeholders to invest in a dental hygiene based mid-level provider model in Oregon. There is strong support from practicing dental hygienists in Oregon for a new mid-level provider model utilizing a registered dental hygienist. Many of the barriers that are believed to limit the practice of EPP dental hygienists involve procedures that are within the scope of practice of a mid-level provider. A large pool of interested candidates exists across the state of Oregon and should be recruited for pilot programs seeking to teach new skills to the existing categories of dental professionals. To reach these interested individuals, the most feasible model for educational delivery is an online format for didactic skills combined with a clinical internship. With increasing legislation supporting pilot programs to explore implementation of alternative workforce models in oral healthcare across the country, flexible models of education should be explored. Amy E. Coplen, RDH, EPDH, MS is the associate dean for interprofessional education and an associate professor; Kathryn Bell, RDH, MS is an associate professor; Gail L. Aamodt, RDH, EPDH, MS is an associate professor; Lynn Ironside, RDH is a member of the dental hygiene advisory board; all at the School of Dental Hygiene Studies, Pacific University, Hillsborough, OR.
. Utilization of nondentist providers and attitudes toward new provider models: findings from the national dental practice-based research network. J Public Health Dent. 2013 Summer;73:237-244.
. Shortage designation: health professional shortage areas & medically underserved areas/populations [Internet]. Washington (DC); U.S. Department of Health and Human Services; 2012 [cited 2016 Sept 13]. Available from: http://bhpr.hrsa.gov/shortage/.
. Expanding access to care through mid-level oral health practitioners [Internet]. Chicago (IL): American Dental Hygienists' Association; 2016 [cited 2016 Nov 14]. Available from: https://www.adha.org/resources-docs/Expanding_Access_to_Care_through_Mid-Level_Oral_Health_Practitioners_08-16.pdf.
. Facts about the dental hygiene workforce in the United States [Internet]. Chicago (IL): American Dental Hygienists' Association; 2016; [cited 2016 Nov 7]. Available from: https://www.adha.org/resources-docs/75118_Facts_About_the_Dental_Hygiene_Workforce.pdf.
. Patterns of dental therapists' scope of practice and employment in Victoria, Australia. J Dent Educ. 2009 Mar;73:416-425.
. Dental therapists: a global perspective. Int Dent J. 2008 Apr;58:61-61-70.
. The international dental therapist: history and current status. J Calif Dent Assoc. 2011 Jan;39:23-29.
. A review of the global literature on dental therapists. Community Dent Oral Epidemiol. 2014 Feb;42:1-10.
. Dental health aide [Internet]. Anchorage (AK); Alaska Native Tribal Health Consortium; 2016 Jun 10; [cited 2016 Sept 13]. Available from: http://anthc.org/dental-health-aide/.
. Accreditation standards for dental therapy education programs [Internet]. Chicago (IL); American Dental Association; 2015 Feb 6; [cited 2016 Feb 9]. Available from: http://www.ada.org/~/media/CODA/Files/dt.ashx.
. California dental hygiene educators' perceptions of an application of the ADHA advanced dental hygiene practitioner (ADHP) model in medical settings. J Dent Hyg. 2015 Dec;89:390-396.
. Access to care position paper [Internet]. Chicago (IL): American Dental Hygienists' Association; 2001 [cited 2016 Nov 7]. Available from: http://www.adha.org/resources-docs/7112_Access_to_Care_Position_Paper.pdf.
. Competencies for the advanced dental hygiene practitioner (ADHP) [Internet]. Chicago (IL): American Dental Hygienists' Association; 2008 Mar 10; [cited 2016 Feb 9]. Available from: http://www.adha.org/resources-docs/72612_ADHP_Competencies.pdf.
. On the pediatric oral health therapist: lessons from Canada. J Public Health Dent. 2008 Winter;68(1):53-56.
. Comparison of clinical performance of dental therapist trainees and dental students. J Dent Educ. 1974 May;38:268-272.
. Alternative workforce models continue to develop in dentistry. [Internet]. RDH; 2016 Apr; [cited 2016 Nov 7]. Available from: http://www.rdhmag.com/articles/print/volume-31/issue-6/features/the-mid-level.html.
. Early impacts of dental therapists in Minnesota [Internet]. Minneapolis (MN); Minnesota Department of Health; 2014 Feb; [cited 2016 Dec 19]. Available from: http://www.health.state.mn.us/divs/orhpc/workforce/dt/dtlegisrpt.pdf.
. Direct access states [Internet]. Chicago (IL): American Dental Hygienists' Association; 2016 Dec; [cited 2016 Apr 25]. 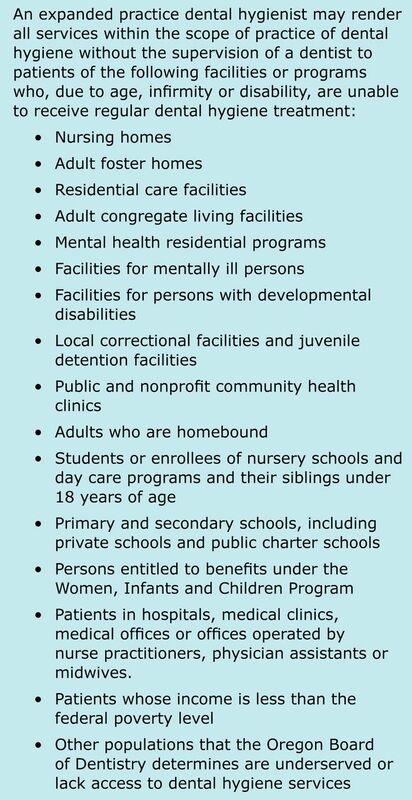 Available from: https://www.adha.org/resources-docs/7513_Direct_Access_to_Care_from_DH.pdf.
. Evaluating the impact of expanded practice dental hygienists in Oregon: an outcomes assessment. J Dent Hyg. 2016 Jun;90 Suppl 1:33-41.
. Barriers faced by expanded practice dental hygienists in Oregon. J Dent Hyg. 2015 Apr;89:91-100.
. A qualitative study of limited access permit dental hygienists in Oregon. J Dent Educ. 2008 Mar;72:329-343.
. Senate Bill 738 [Internet]. Salem (OR); Oregon State Legislature; 2011 Jun 15; [cited 2016 Sept 13]. Available from: https://olis.leg.state.or.us/liz/2011R1/Downloads/MeasureDocument/SB0738/B-Engrossed.
. A qaulitative case study of the legislative process of the hygienist - therapist bill in a large midwestern state. J Dent Hyg. 2013 Oct;87:275-288.
. The benefits of dental hygiene-based oral health provider models [Internet]. Chicago (IL): American Dental Hygienists' Association; 2014 Jul [cited 2016 Nov 9]. Available from: http://www.adha.org/resources-docs/7116_Benefits_of_Dental_Hygiene.pdf.
. The principles, competencies, and curriculum for educating dental therapists: a report of the American Association of Public Health Dentistry Panel. J Public Health Dent. 2011 Spring;71:S9-19.
. Training new dental health providers in the United States. J Public Health Dent. 2011 Spring;71:3-8.
. Oregon tribes dental health aide therapist pilot project [Internet]. Portland (OR); Northwest Portland Area Indian Health Board; 2016 Jun 1 [cited 2016 Dec 19]. Available from: https://public.health.oregon.gov/PreventionWellness/oralhealth/DentalPilotProjects/Documents/100-abstract.pdf.
. Training dental hygienists to place interim therapeutic restorations [Internet]. Portland (OR); Oregon Health & Science University 2016 Mar 10 [cited 2016 Dec 19]. Available from: https://public.health.oregon.gov/PreventionWellness/oralhealth/DentalPilotProjects/Documents/200-abstract.pdf.